Choosing the right incubator for your particular needs can be a daunting task. There are many different models and variants to incubate your hatching eggs and each model is slightly different having different levels of functionality. From the basic still air incubator where you turn eggs manually 3 times per day, set the temperature and add water to a reservoir to provide the correct humidity, to the fully automatic incubator that can set temperature and humidity for the right species with the press of a button, we look at the things you might want to consider before you invest some money and buy an incubator. 1How many eggs? Do you want to incubate half a dozen hatching eggs as part of a school hatching project for example or do you want to incubate a couple of dozen eggs to perhaps replace stock? It is worth taking into consideration the fact that generally fertile hatching eggs for chickens and ducks are sold by the half-dozen. When you hatch out some chicks, you will get on average 50% cockerels and unless you are very lucky, not all of your eggs will hatch. 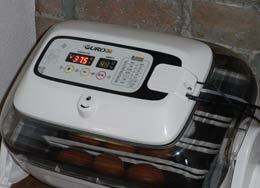 Most of the hobby incubators hold 20 to 25 standard size hens eggs. 2 Still air or forced air incubator? There are 2 main types of incubator. Still air and forced air. The difference is simply a fan. In forced air incubators, a fan circulates the air around the incubator which keeps the temperature constant in all parts of the incubator. The temperature can be measured anywhere within the airflow. In a still air incubator, there is no fan, the heat stratifies (forms layers) inside the incubator so the temperature is different between the top and bottom of the incubator. Care has to be taken when setting the incubator up, the temperature at the centre of the egg should be correct for the species being incubated (37.5ºC for chickens eggs for example). The temperature at the height of the top of the hatching egg is what is usually measured with a correction being applied according to the manufacturer’s instructions. 3Manual, semi or fully automatic control? There are various levels of control available. In general, the less you want to pay, the more you will have to do yourself. Hatching eggs need to be kept at the right temperature and humidity, as well as need to be turned at regular intervals to stop the developing embryos from sticking to the inside of the shell. Temperature is set and regulated pretty well on most incubators but humidity can be hard to get right and keep at the right level. Manually turning eggs is impossible if you work full-time as eggs should be turned at least 3 times a day (always an odd number so they don’t sit on the same side every night). If you do use a manual incubator, set an alarm for the next turn immediately after turning your hatching eggs as it is very easy to forget them over the few weeks you’ll need to turn them. The Brinsea Octagon 20 incubator shown on the right turns eggs automatically by slowly rocking the whole incubator backwards and forwards continuously. Other incubators can have moving floors underneath egg trays or metal bars that slide back and forth, rolling the eggs that sit in between. 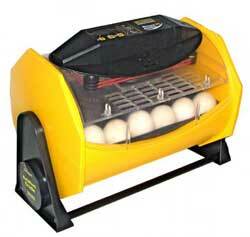 There are many different designs of incubator on the market. 4Ease of cleaning. You may not be thinking about this now but believe me, when you come to clean your incubator after the hatch and see the mess that is made you’ll be pleased you considered the cleaning when you bought your incubator. Hatching eggs is great fun but cleaning up afterwards is not. Apart from the mess that is made during the hatch, you will find that as the chicks dry out, there is a lot of fine fluff that gets into every little corner, behind every little bit of mesh that stops you from putting your fingers in the fan (in forced air incubators) and everywhere else that is inaccessible. You need to clean and sterilise your incubator between hatches since bacteria multiply incredibly quickly at incubation temperatures and it is doesn’t take much for your eggs to go bad and even explode leaving a mess and even more bacteria over your remaining good eggs. All of these factors will influence the cost of the incubator and it’s all very well specifying an all singing, all dancing “Super Hatching Egg GT Turbo” but we all have a budget to consider and it’s usually this that dictates what you can actually get. Whatever you decide upon, bear in mind that mother nature does a far better job and unless you’re in a hurry to hatch, maybe it’s better to get yourself a good broody hen who can take care of all of these things AND bring the youngsters up…? The decision is yours but I certainly would not be without my incubators or broody hens. They both have their uses at different times. Good luck choosing an incubator! 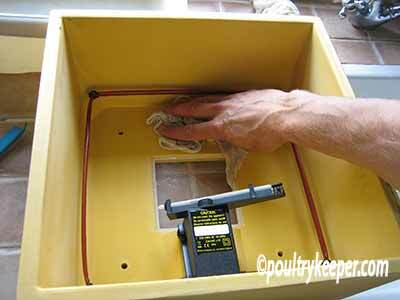 Once you’ve got your incubator, it’s time to read: Setting up your incubator for a successful hatch. Good Luck!